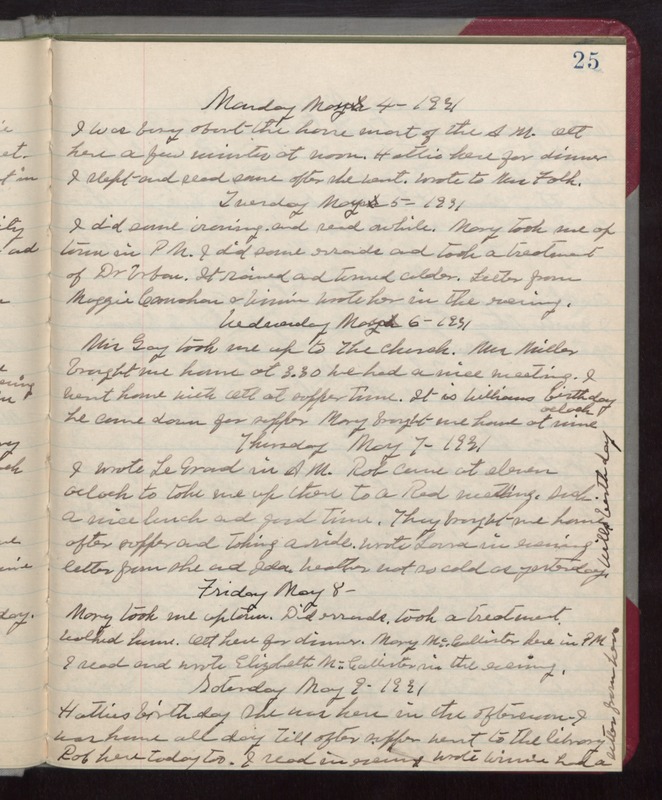 Monday May 4- 1931 I was busy about the house most of the AM. Ott here a few minutes at noon. Hattie here for dinner I slept and read some after she went. Wrote to Mrs Falk. Tuesday May 5- 1931 I did some ironing, and read awhile. Mary took me up town in PM. I did some errands and took a treatment of Dr [Urban]. It rained and turned colder. Letters from Maggie [Carnahan] & Winnie Wrote her in the evening. Wednesday May 6 -1931 Mrs Gay took me up to The Church. Mrs Miller brought me home at 3.30 We had a nice meeting. I went home with Ott at supper time. It is Williams birthday he came down for supper Mary brought me home at nine oclock Thursday May 7- 1931 I wrote Le Grand in AM. Rob came at eleven oclock to take me up there to a Red meeting. Such a nice lunch and good time. They brought me home after supper and taking a ride. Wrote Laura in evening letter from she and Ida. Weather not so cold as yesterday. Wills birthday. Friday May 8- Mary took me uptown. Did errands. took a treatment. walked home. Ott here for dinner. Mary McCallister here in PM I read and wrote Elizabeth McCallister in the evening. Saturday May 9-1931 Hatties birthday She was here in the afternoon. I was home all day till after supper went to the library Rob here today too. I read in evening Wrote Winnie had a letter from her.